Looks like we are going to have a great Christmas on both lakes with high water levels and a really good insect hatch. Remember both lakes will be busy over the Christmas holidays and they should be fishing well as they are now so everyone have fun be safe and have a happy christmas. If you need any information about the fishing or where to go give us a call I'll be happy to help. 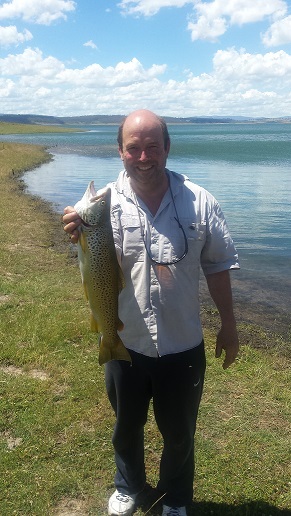 Spent a week at Eucumbene with brother Kevin and fished around Coppermine. The Browns were on but were only interested in flies with just a couple taking a mudeye. Worms were off the menu too. Here he is feeling happy with himself with a couple of his catches. Things are really picking up now on both lake after all that rain on the weekend the rainbows and browns are really getting active both lake are rising well all over new ground. Remember go small that seems to be the go. At the moment fish are rising everywhere and most fishermen are having fun what can l say but get up there it’s really good after all the rain on the weekend the fishing is just getting better.The lake is looking so good the water is all over new ground and the fish are moving everywhere when casting try not to get into the water the fish are in nice and close best results have been fishermen casting out off the water. As I said get up there it's fishing well and thanks to the Snowy Hydro and all that rain the lake looks so good and the fishing is good. If your a fly fishermen it’s time to get up there this is what we have been waiting for don’t miss it!! 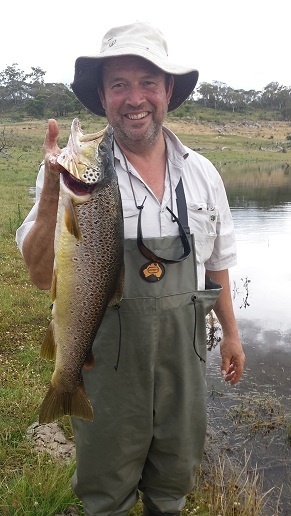 Jindabyne is fishing well along hatchery bay with good reports off rainbows and browns late in the afternoons woolly buggers, Mrs Simpsons, Muddlers are the best flies. So if anyone is going up to Jindy let us know we would like more reports thanks. The river is still looking good and flowing well good reports are coming from the township Thredbo Village and the ski tube late in the afternoons and early mornings. With all the rain on the weekend reports have been good down around the mouth with plenty off food being washed down from the floods. Down at paddy’s corner there has been some good results with rainbows and browns. Don’t forget about up around the diggings and the little Thredbo river plenty off little fish but fun. Best places on the river have been up higher remember the best times are early mornings and late afternoons if you are going out in the middle off the days look for the deeper waters. 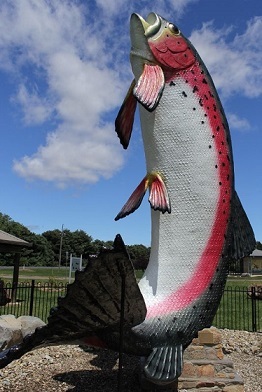 EUCUMBENE RIVER:- The river is picking up with all that rain last weekend and looking good remember fish at the right time you will have a good time if it's a cloudy day you can fish all day! Eucumbene river is running well from top to bottom just like the Thredbo we have been getting reports off fishermen not doing so well as i have been saying if your going fishing in the middle off the day it will be tuff you will have more fun and better results in the afternoon and early mornings this is when the fish are more active. We are still getting good reports up higher in the river around Kiandra and down around Sawyers. Trust me you will have a good time everywhere if you fish at the right time and the fish are there small and big. Don’t forget you have the Murrumbidgee river as well most locals are have a good time. Has been doing ok in places mostly in the shallow parts on the lake have been getting the most fish mudeye’s worms and Grubs are doing the job early mornings and late in the afternoons. Bait fishing has been good in most bays with the Mudeye’s and worms, Grubs are working well still getting reports on the browns and now a few rainbows coming in at nigh time. Best reports have been coming out off fryingpan before the caravan park and over at Rushes bay with the mudeye’s, worms and grubs working well spinning has Improved with minnows and blades doing the job. has Improve over the last week mudeye's, worms, grubs and spinning have been getting the results. Best lures are little Tassies, Snowy minnows, and Blades. Bait fishing has dropped off in most areas around Buckenderra so wonder over to Wainui bay thing are a little better. trolling has been ok but out in the deeper waters slow is the key. Best lures are Tassie 48, Y48, Y82, 119, 36 Stings 17, 22 Strike pro Blades and Minnows. Best bait is Mudeye’s and worms power bait with a 2 meter lead. JINDABYNE, Is fishing a lot better and will Improve once the mudeye's start moving the rainbows are in good condition along with the browns. after a windy day best lures have been Stings 14, 1, 2, 7, 22, Tassie Y48, 26, 73, Y89, Y36, 105, Rapala 7rainbow and brown, BALSA XTREME rainbow and the Scatter rap spotted dog. Mudeye fishing has been good along with the worms power bait has been picking up some good rainbows fishing with lures around the bank late in the afternoons has been ok mostly little tassie devils have been getting good results Trolling with rapalas have been good and tthe strike pro blades. Down at the bottom end off the lake has been a little quite but early morning fishing has been ok with power bait and grubs. Trolling around the Island has mixed results but if you can get up before the sun gets up you should d alright with Tassies, Blades and Sting lures.